Teesport Intermodal Rail Terminal allows customers to move cargo further with frequent, reliable and cost-effective rail links. Following an increase in traffic and a demand for ports to offer a fully integrated multi-modal transport infrastructure, Teesport has seen major investment in its rail facilities. The Port now offers 15 services a week and more daily services to Scotland than any other port in the North of England, playing a significant role in the transportation of northern bound freight. With 50% growth in rail services expected over the next 10 years, Teesport is set to further cement its place as the North’s leading rail hub for global imports and exports. Direct Scottish trains are purposely timed with ferry arrivals, meaning goods are efficiently distributed without sitting on the quayside or waiting in storage. These timed services have been built on trusted partnerships with operators and close relationships with customers; working together to deliver solutions that benefit businesses. For cargo heading South, daily services operate to Felixstowe unlocking key markets in the South East and East Anglia. With 38 million vehicles on the UK’s roads, the government has placed increased importance on the use of rail freight in an attempt to reduce congestion and traffic delays on the road network. Our rail services offer a solution that fits with this agenda, while minimising unwanted hold ups often associated with Britain’s motorways. A continuing lack of HGV drivers also presents a problem, with a current shortage of 45,000 drivers that is likely to increase in the coming years. 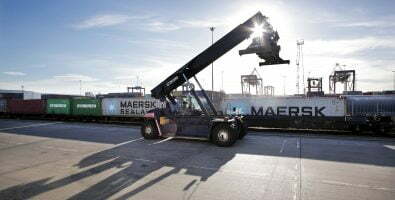 Our rail freight offering can also be provided in conjunction with added value services, making Teesport a thriving hub of portcentric activity; all exclusively managed by PD Ports. We understand customer needs, and when combined with our time-served experience and in-depth knowledge, we provide a simplified and centralised process, with one single point of contact.